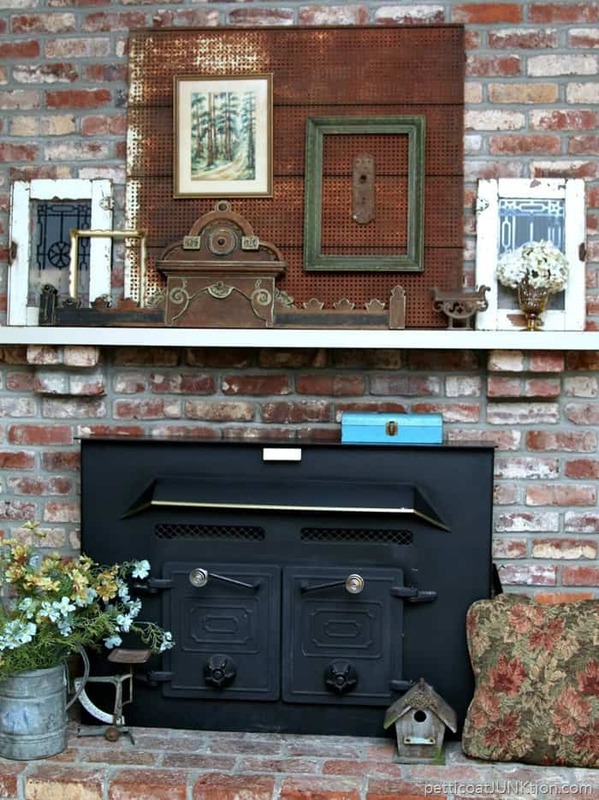 I change mantel decor with the seasons and I’ve developed a system that makes the job fun and easy. I made a list of things to remember when decorating the mantel and the tips can be applied to just about decorating jobs. You just need the basic ideas and then run with them. I started writing this post back in January. I had just taken down all the Christmas stuff and redecorated the mantel. At the time I thought I would write a small post about the process. Not that I’m an interior designer or anything. Well, I never finished the post and I never got around to decorating for Spring. Now Summer is in full swing. Yesterday was so darn hot again and no way was I going outdoors. 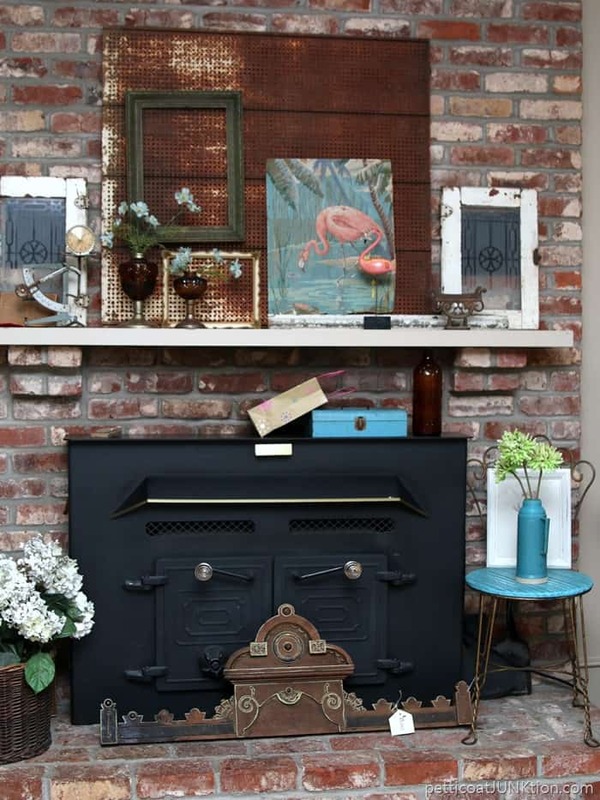 So guess what….I decorated the mantel. 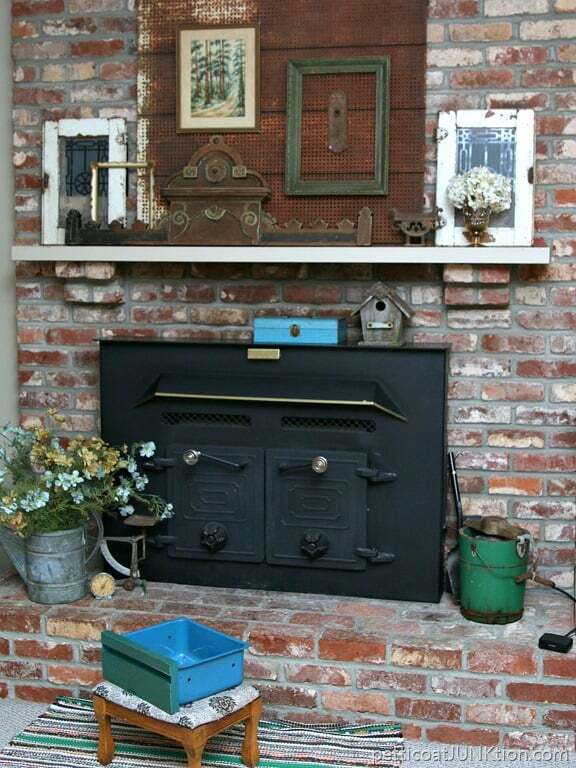 This is how our fireplace and mantel looked yesterday before the makeover. You can see there are things just dropped everywhere. 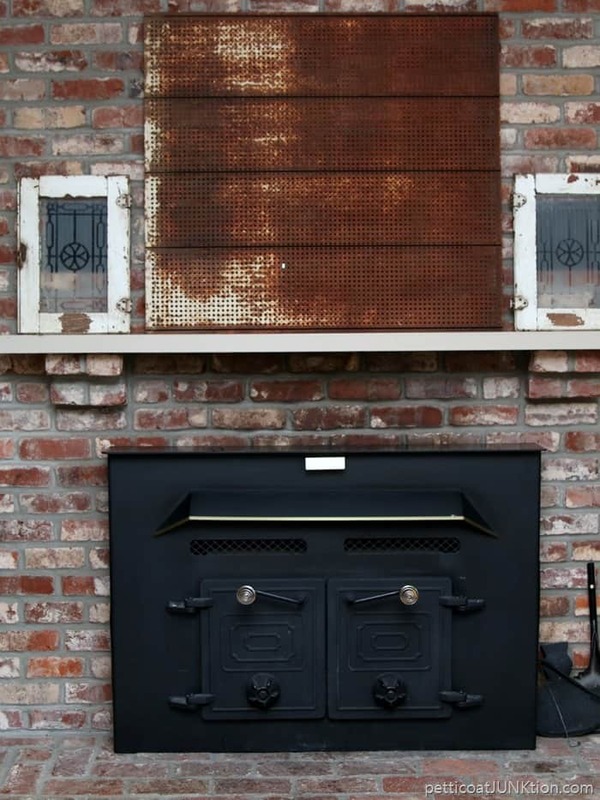 The beautiful architectural piece has been sitting on the hearth for 2 months….just waiting. 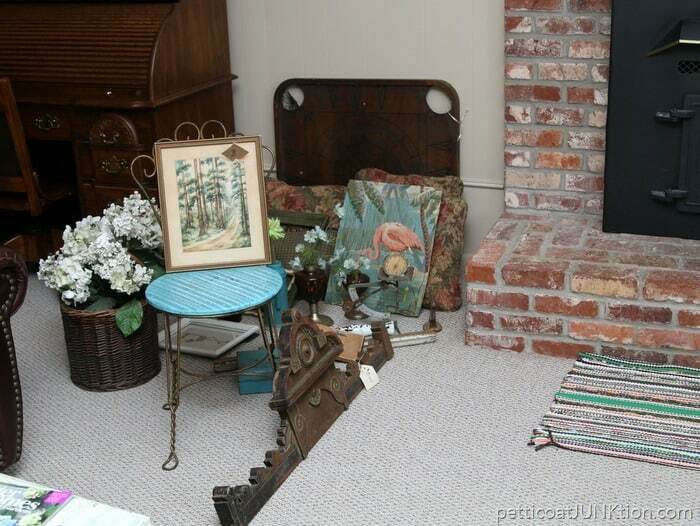 There are odds and ends sitting on the fireplace insert including a button snowman. Other little extras on the mantel because I find things I like and just sit them up there. To begin the makeover I took everything off of the fireplace. 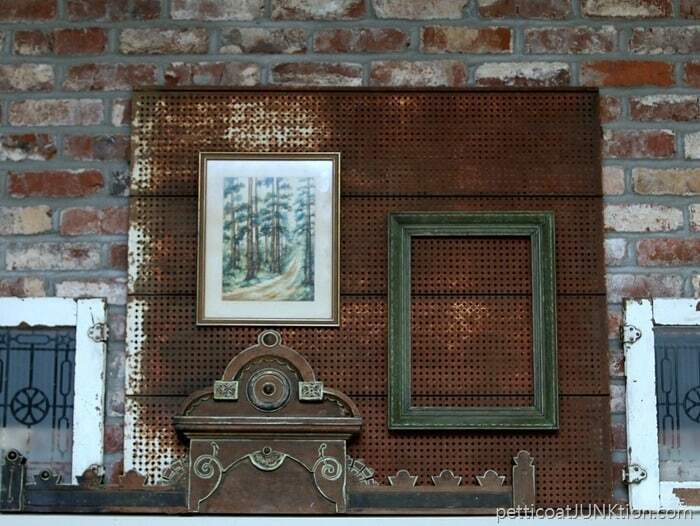 Except for the rusty metal piece and the two vintage cabinet doors….purchases from the Nashville Flea Market. Now it’s time to start decorating. The colors of the den are warm earthy tones so that’s what I’m going with for this makeover…tending more toward muted tones. I really love that architectural piece. It cost $15 and it was worth every penny. 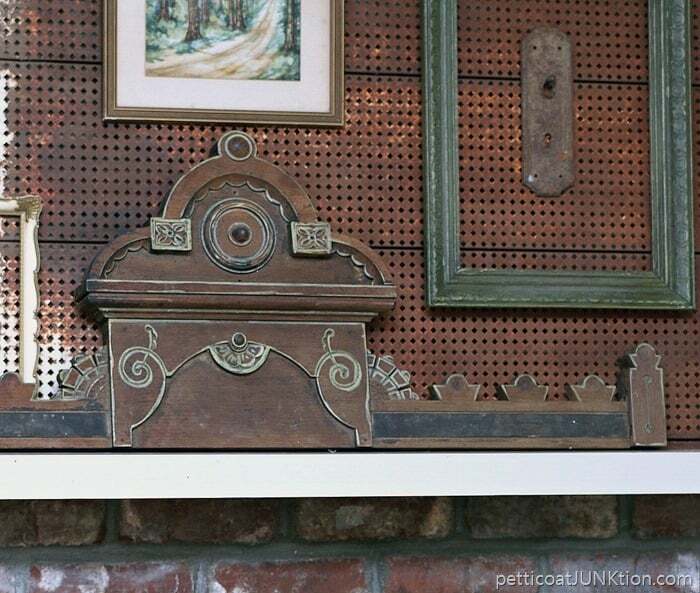 I think it was part of a dresser at one time?? I set the piece on the mantel (not centered) and looked around to see what else I had. It’s not necessary to go out and buy a bunch of new things. Sure, it might be nice to buy one or two things, but try to work with what you have. I did buy the focal piece and the small framed photo…. another thrifty find….$3. I didn’t buy them with the mantel in mind, I knew eventually I would use them somewhere. The watering can full of flowers was on the kitchen table, the glass of dried hydrangeas was in the small living room, the frames and blue metal box were leftovers from the last mantel makeover. The boot thingie was sitting on a side table. A lot of trial and error goes on. I try things and if they don’t work I keep looking. Sometimes it takes me all day to put the mantel together. Yesterday it just took an hour or so. An antique door knob back plate looked perfect hanging in the center of the green frame. I played around with the ice cream bucket, the vintage turquoise refrigerator bin, and the stool in various scenarios but nothing worked. Flowers add charm and help soften the look but fabric adds soft texture. All that wood and metal needed softening. For fabric I ended up with the pillows that match our armchair. The chair and pillows are about 15 years old. Although this is the last tip…it’s the most important. Taking photos as you go along…or when you think you are done…is the secret to the whole display thing. Have you ever looked at a photo taken in your home and thought “Boy that (fill in the blank) needs to be moved…or…”That throw does not match the couch”….. you get the idea. I first noticed this when I was taking photos of projects and editing them for posts. I would think all my staging looked great but after looking at the photos I realized something was out of place, or there was too much of something, or whatever. That’s how I learned to take a photo and study the display. You would think just standing back and looking at the display would do it. Why can we see things in a photo that we don’t notice in person, or however you want to say it. Yesterday during the decorating process I took photos of the mantel. I moved the birdhouse from sitting on the insert to sitting beside the pillows, set the scale next to the flowers, and made a few other tweaks. That’s the 6 tips I have for you! Do any of the things I just said make sense? What decorating tips do you have for me? 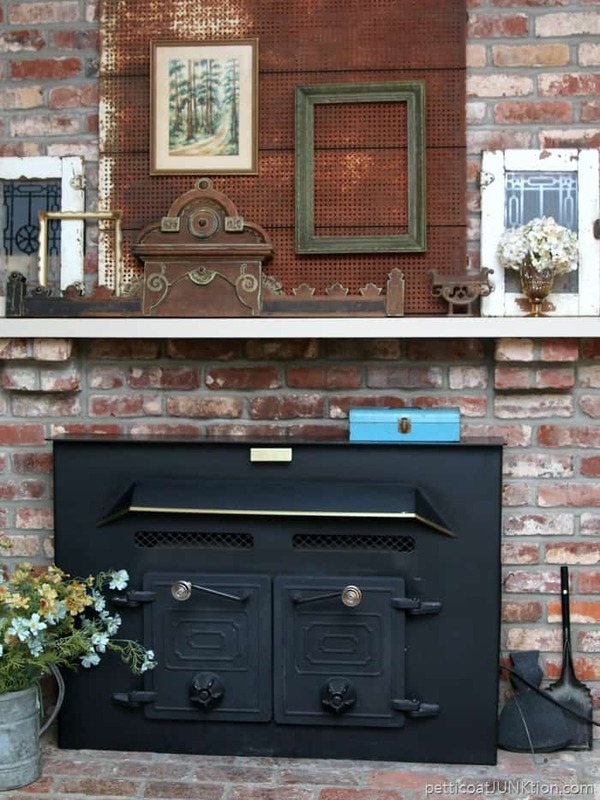 I like your mantel and especially like the architectural piece! Enjoyed the whole post. Wrong tense…the glass of hydrangeas WAS in the small living room. Thank you Donna! I actually think I kept reading that sentence thinking something wasn’t right.